It's Tuesday, and you're already wishing it was Friday after a long day at work. If only there was a delicious food item that started with the same letter as "Tuesday" that would become synonymous with trendy deals. You're in luck! If you love Tex-Mex, street tacos and going up... on a Tuesday, here are some of the best Taco Tuesdays in Tampa. Queso and margaritas not included. Casa Ramos. One of the best authentic Taco Tuesday deals in town resides in Tampa Palms with Casa Ramos. $1 regular tacos, $2 for carnitas and $4 margaritas. This restaurant has a large dining room area, bar area and serves cantina chips and salsa. 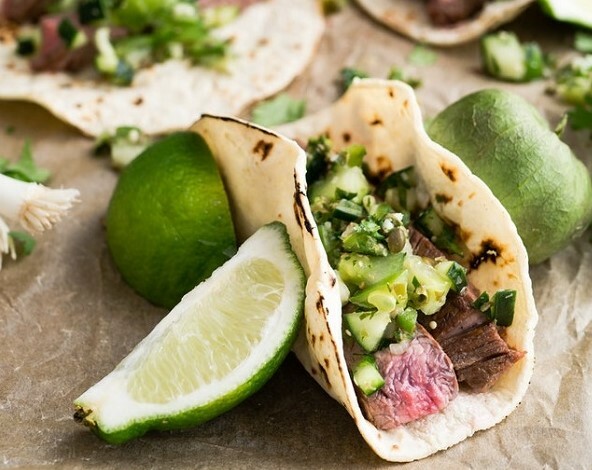 The tacos are definitely worth the wait, and if you feel like coming back for something different the authentic Mexican dinners feature full chicken, pork and steak meals all at friendly prices. Bartaco. If you're looking for a fresh, healthy and modern alternative to your every-week Taco Tuesday try Bartaco. Located in Hyde Park, it offers a relaxed, coastal approach to street food, cocktails, and beer with ingredients from the familiar fish, chicken, and pork, to the exquisite in cauliflower, ribeye, falafel, and duck. The pork belly and chorizo options are to-die-for and the fresh, hand-crafted margaritas make this restaurant well worth the wait. Green Lemon. Green Lemon in SoHo offers a combination of delicious Mexican fare, house-made margaritas the size of your head, and nightlife that offers live DJs, dancing, and local art. Taco Tuesday deal includes $2 tacos (beef, chicken, ground turkey pork or fish) and $3 Coronas. The regular menu also offers $3 - $4 street tacos including variations of your favorites in ancho chicken, carnitas, and mahi-mahi as well as a flavorful Taco Rosa with cauliflower, radishes and blue cheese dressing. With a Fiesta Hour 3-7 p.m. daily and a variety of margarita and sangria choices, Green Lemon is a great option if you plan to stay out in SoHo. Vallarta's Mexican Restaurant. Vallarta's has a few locations across Hillsborough County, but the Tampa Palms location takes the cake (or should I say beef.) Featuring $1 tacos all day Tuesdays and Wednesdays and a Happy Hour from 2-7pm every day, with flavorful, margaritas and sangrias, this is a great deal for your mid-day lunch break or after work wind-down. Tacos come in combinations with chicken, beef, bean or veggie in hard or soft tacos. Since tacos are just $1 grab one protein hard taco and place it inside a refried bean soft taco, you won't be disappointed. Cantina chips and salsa are also served on the table to complete the experience. Ciccio Cali Tampa Palms & Ciccio Cali Brandon. One of the best-kept secrets is Ciccio Cali's Taco Tuesday in both their Brandon and Tampa Palms locations. An alternative to this coastal inspired, fresh food menu featuring bowls, stir-frys, salads and pizzas, Ciccio's Taco Tuesday offers delicious street tacos for $2 that aren't on the regular menu. Braised short rib, seared ahi tuna, Brazilian chicken, steak, pork, and other combinations are so affordable and filling that you have to come back twice to try them all. In addition to $2 tacos, Ciccio offers $2 glasses of wine and sangria and select beer drafts for $2, too! Miguelitos Taqueria Y Tequilas. Miguelitos in South Tampa off Kennedy was voted "Best New Place For Tequila and a Taco" in 2016 and is famous for the only tequila tap in the Bay Area. Offering $2 traditional street tacos and $3 craft cocktails from 6 p.m. to close, this is a great twist on your traditional Tuesday. Miguelitos also offers $1 off all other tacos including the pork belly, BLT, surf y turf, and filet mignon. Tacoson Mexican Grill. Tacoson offers affordable authentic Mexican fare and is conveniently located off 56th in Temple Terrace. Although there's no specific Taco Tuesday deal, the prices are great every day. From the original owner of Taco Bus, the protein choices are both traditional and authentic. Enjoy combination meals or tacos, burritos, quesadillas and more a la carte starting from $2.50 per taco. Tijuana Flats. Tijuana Flats is a chain fan-favorite that has several locations in the Bay Area. Described as "Tex-Mex how you like it," The Flats offers Tijuana Tuesdaze which includes two tacos hard or soft, chips and a drink for $5.99. Offering several of your favorites with chicken, pork, beef, steak or bean there are plenty of choices to try and make it PowerLite with low-fat cheese and fat-free sour cream if you're watching your waistline. Wine and beer are also available. Taco Dirty. This new Soho hotspot has begun to sell $2 Tacos, $3 Beers and $4 Margaritas on Tuesday's to celebrate your favorite day of the week! Stop by today for some quality Mexican with a new flare! So if you're looking for a fun excuse to go out on a Tuesday, hit up a Happy Hour and enjoy some fast and affordable Tex-Mex with these great deals on Taco Tuesday in Tampa. What to make this a weekly trend? Bookmark Try These Trendy Taco Tuesday Deals in Tampa, to try them all! If you've discovered another great deal in the 813area or want to express your experience, subscribe to the website and let us know in the comments; it's free! And don't forget to check out our page on the best Mexican restaurants in Tampa for a complete list around town.